The Southern Agricultural Society Inc. Celebrating our 141st show this year, we are hoping that it will equal and/or exceed the record breaking 2018 show. Stay tuned as updates on all activities will be noted as they happen. 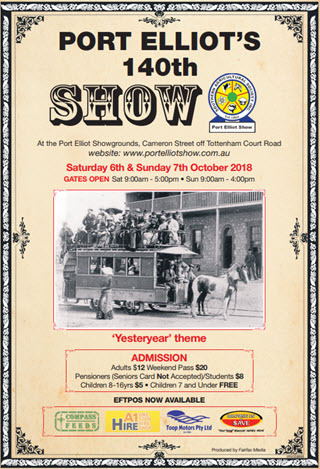 Port Elliot Show Patrons: Mrs Lorraine Pomery – Noted Port Elliot Historian OAM, Hon. Mr Dean Brown AO & Michael Pengilly MP. Contact Gayle (Show Secretary) for more information and to apply. Postal Address: Southern Agricultural Society Inc.